Collins & Co – Chartered Accountants Ltd does not warrant the accuracy, adequacy or completeness of material on this website. All information may be changed, supplemented, deleted or updated without notice at the sole discretion of Collins & Co – Chartered Accountants Ltd.
Collins & Co – Chartered Accountants Ltd does not guarantee that the website will be free from viruses, or that access to the website will be uninterrupted. The copyright for the content on this website is owned or licensed by Collins & Co – Chartered Accountants Ltd and is protected under the Copyright Act 1968 (Cth) and by other copyright laws in both New Zealand and other countries. No material on this website may be reproduced, adapted, uploaded to a third party, linked to, framed, performed in public, distributed or transmitted in any form by any process without the specific written consent of Collins & Co – Chartered Accountants Ltd.
All custom graphics, icons, and other items that appear on the website and all associated trademarks, are trademarks of Collins & Co – Chartered Accountants Ltd.
Collins & Co – Chartered Accountants Ltd does not encourage you to make feedback, suggestions, comments or requests (“comments”) but these comments may be made at the contact page of this website and if you do make comments, you acknowledge that: they will not be considered confidential or proprietary, and Collins & Co – Chartered Accountants Ltd is under no obligation to keep such information confidential, and Collins & Co – Chartered Accountants Ltd will have an unrestricted, irrevocable, world-wide, royalty free right to use, communicate, reproduce, publish, display, distribute and exploit such comments in any manner it chooses. The website may contain links to third-party websites and resources (“linked sites”). These linked sites are provided solely as a convenience to you and not as an endorsement by Collins & Co – Chartered Accountants Ltd. Collins & Co – Chartered Accountants Ltd makes no representations or warranties regarding the availability, correctness, accuracy, performance or quality of the linked site or any content, software, service or application found at any linked site. Collins & Co – Chartered Accountants Ltd may receive payments and/or commissions from operators of linked sites in relation to goods or services supplied by the operator as a result of you linking to the third party website from the Collins & Co – Chartered Accountants Ltd website. Collins & Co – Chartered Accountants Ltd generally encourages and agrees to your linking to the Home page through a plain text link on your website without the need for agreement between yourself and Collins & Co – Chartered Accountants Ltd. However, linking to any other page of the website is strictly prohibited, without express written permission from Collins & Co – Chartered Accountants Ltd.
Collins & Co – Chartered Accountants Ltd makes no representations or warranties about the accuracy, completeness, security or timeliness of the content, information or services provided by the website and disclaims all warranties, either express or implied, statutory or otherwise, including but not limited to the implied warranties of merchantability, non-infringement of third parties’ rights, and fitness for a particular purpose. If Collins & Co – Chartered Accountants Ltd is found responsible for any damages, Collins & Co – Chartered Accountants Ltd is responsible for actual damages only. 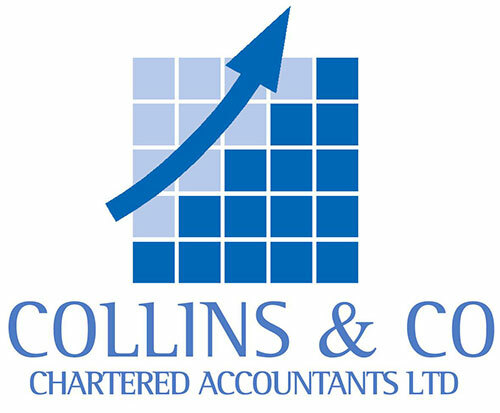 In no event shall Collins & Co – Chartered Accountants Ltd, be liable for any incidental, indirect, exemplary, punitive and/or consequential damages, lost profits, or damages resulting from lost data or business interruption resulting from the use of or inability to use the website.